Cricket - Parish Cup semi-final - Booth v Warley. 'Ben Atkinson bats for Booth. Last year’s top two in the Spenser Wilson Halifax League, Booth and Warley, fought out a tense, close contest on the second Saturday of the 2017 season. Number 11 batsman Robert Cockroft settled the contest in favour of champions Booth, hitting a Luke Duckitt delivery to the boundary behind point to give the visitors a one-wicket win. There was some good bowling and the wickets were shared on a decent pitch. Ben Atkinson (69), back from playing football with Brighouse Town, and Greg Keywood (33) were the only two to stand firm as Warley were dismissed for 136. That total was almost enough as the home attack chipped away at Booth’s batting line-up and were boosted when visiting top scorer Richard Laycock 24) was run out at the nonstriker’s end when a ball hit back down the pitch hit the wickets via the bowler’s fingers. Mark Johnstone, called up from the seconds, took Booth to the brink of victory with 21 not out before the experienced Cockroft struck the winning blow. Booth have 23 points, the same as promoted Oxenhope, but it is Thornton who are showing the way with a maximum 24. Thornton romped to a 142-run win at Northowram Hedge Top, who were bowled out cheaply for the second week in a row. Joshua Hutchinson made 72 for Thornton in the visitors’ 240 all out and Ross Parr then took five for 47 as the hosts capsized from 71 for two to 98 all out. Oxenhope were 59 run winners at Triangle thanks to excellent performances from Josh Tetley (94 no) and Scott Mallinson (six for 65). 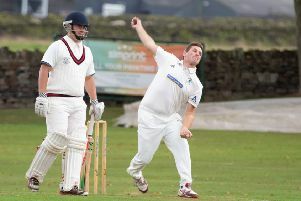 Mytholmroyd lost their last five wickets with their total on 52 at Copley, losing by 104 runs. Experienced Mark Baldwin applied him,self well to help Copley to 156 for eight with a knock of 56 and then it was over to Chris Dennison (five for 25) and Ian Hartley (four for 21) to complete the job. It was wickets, rather than runs, which were hard to come by when Jer Lane made the short trip to Queensbury. Queensbury posted 243 for three, with Hanif making 71 runs, but Lane knocked them off for the loss of only Ian Hall (67) as Raqeeb Younis contributed 123 before retiring hurt. Ben Watkins scored 105 at the top of the Sowerby SP order as his side beat visitors SBCI by 96 runs. Sowerby made 248 for eight and Chris Greenwood (five for 54) helped limit the visitors to 152 with Simon Wood (82) in good form for the second week running. Premier Division: *Copley 156-8 (M Baldwin 56), Mytholmroyd 52 (C Dennison 5-25, I Hartley 4-21): pts 12-2. Thornton 240 (J Hutchinson 72, Brooksbank 57, Irshad 5-84, Hemblys 4-46), *Northowram HT 98 (Parr 5- 47): pts 12-3. *Queensbury 243-3 (Hanif 71, Bilal 70, Gerrard-Harrison 64), Jer Lane 245-1 (Younas 123 retired hurt, Hall 67): pts 3-9. *Sowerby St Peter’s 248-8 (Watkins 105, Hayes 48), SBCI 152 (Wood 84, Grenwood 5-54): pts 12-4. Oxenhope 265-9 (J Tetley 94*, Bartlett 47), *Triangle 206 (Whippey 56, Mallinson 6-65): pts 12-5. *Warley 136-9 (Atkinson 69), Booth 138-9: pts 3-12. Points: Thornton 24, Oxenhope 23, Booth 23, Jer Lane 21, Copley 16, SBCI 16, Sowerby SP 15, Mytholmroyd 14, Triangle 8, Queensbury 7, Warley 7, Northowram HT 4. Southowram are the only side with maximum points in the middle section after they survived a later clatter of wickets to win at Bridgeholme. Tom Belfield (six for 66) and David Jowett (four for 57) did the hard work for the visitors by dismissing their Eastwood hosts for 157, a modest score on a small ground. Jason Wilkinson (90) and James Broadbent (37) had the Rams steaming towards a wide-margin victory at 133 without loss but seven wickets fell for the addition of 15 runs before victory was sealed. Third-wicket pair James Taylor (62) and Joshua Wood (55) helped Sowerby Bridge to a six-wicket home win over Blackley in the battle of relegated sides. Dave Robinson took five for 31 as Cullingworth put an opening day defeat behind them with a 100-run win at Shelf. A stand of 117 between Ted Conlon (51) and Jack Collins (88) helped Stones chase down Great Horton PC’s 183 for nine and win by five wickets. Division One: *Bridgeholme 157, Southowram 158-7: pts 4-12. Cullingworth 215-7, *Shelf 100 (Robinson 5-31): pts 12-3. Blackley 198-7, *Sowerby Bridge 202-4: pts 4-11. Great Horton PC 183-9, *Stones 184-5: pts 4-11. Points: Southowram 24, Sowerby Bridge 23, Bridgeholme 16, Blackley 16, Cullingworth 16, Stones 12, Great Horton PC 5, Shelf 5. Illingworth SM and Low Moor both put former Huddersfield Central League sides to the sword in Division Two. Illingworth had a 168 run victory at home to Birchencliffe. They recovered from 105 for six thanks to Ben Robertshaw (111 no) and Stephen Cook (48), who sent the total soaring to 289 for nine. Jamie Moorhouse then took six for 50 as Birchencliffe stalled to 121 all out facing such a lofty target. Low Moor were even more handsome winners, beating Leymoor by 206 runs. Bradley Osbourne (69) and Massod Zaman (68 no) showed the way as Moor made 267 foe eight. Mark Stokes then took five for 10 to ensure a miserable afternoon for the Golcar outfit. The closest match in the section was at Old Town where Greetland won by three runs. Iliaq Jamal (55), Damien Reynolds (48) and Hizar Hayat (40) helped the visitors from West Vale to 203 for nine and Town fell agonisingly short after Sajid Ramzan had departed for 73. Bradshaw gained 12 points for the second week running, winning by 44 runs at Luddenden Foot. Connor Ryan hit 82 and there were four wickets each for Aaron Buckley and Amy Gibson. Opener Chris Brook’s 65 helped Outlane beat Upper Hopton by three wickets. John Stanger’s (four for 61) did his best for the Mirfield team. Mitesh Mistry (four for 38) and Paul Gelder (six for 68) sent visitors Mount packing for 113 and set up Clayton for an eight-wicket success. Division Two: Mount 113, *Clayton 117-3: pts 1-12. *Illingworth St Mary’s 289-9 (Robertshaw 111*, S Cook 48, Mian 4-69), Birchencliffe 121 (Moorhouse 6-50): pts 12-3. *Low Moor HT 267-8 (Osbourne 69, Zaman 68*, B Williamson 43), Leymoor 61 (Stokes 5-10): pts 12-2. Bradshaw 214-7 (Ryan 82,Baines 4-54), *Luddenden Foot 170 (Broadbent 45, Buckley 4-49, Gibson 4-57): pts 12-4. Greetland 203 (Jamal 55, Reynolds 48, Hayat 40), *Old Town 200 (Ramzan 73, Hayat 4-47): pts 12-6. Upper Hopton 167-9, *Outlane 168-7 (Brook 65): pts 12-4. Points: Illingworth SM 24, Outlane 24, Bradshaw 24, Low Moor 17, Upper Hopton 16, Clayton 14, Birchencliffe 14, Greetland 13, Mount 13, Ludd Foot 9, Old Town 9, Leymoor 5.